When it comes to creating invoices, or tracking your business related expenses and payment, it can be a difficult task. 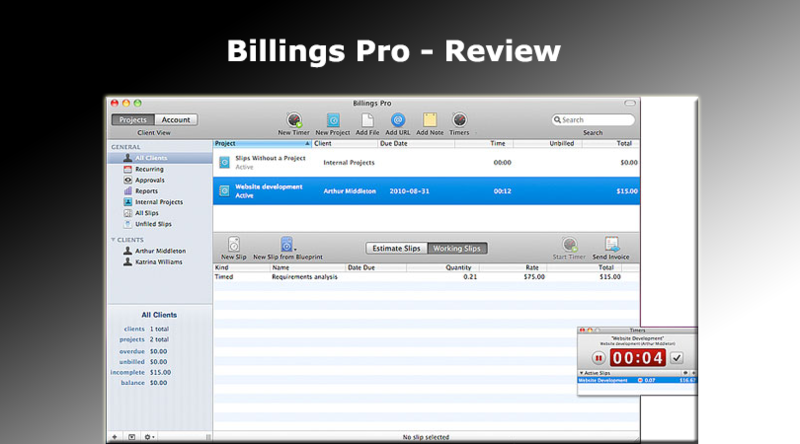 Billings Pro, one of the best mac accounting software, comes to your rescue if you are looking for professional grade invoices, time tracking, and money transactions from your Mac PC. 1. With this software, you can easily add an unlimited number of projects and clients and also create better professional invoices, while being flexible with billing options. It can depend on whether you are charging your clients on time basis or expense, project or service basis. 2. You can easily synchronize your Apple products like iPhones, Macs, iPads, making it easier to handle your business while being on the move. 3. It also assists in identifying overdue invoices along with sending estimates and also run detailed reports about your own business. You can also bill in multiple currencies in case your clients are in different countries. 4. This software comes with ready-made tailored templates from which you can choose and fill all the necessary details and be done with it. 5. You can also keep time track on your various projects and also switch between them with ease. 6. This software also provides you an account management tab that displays which clients are overdue along with which pave paid you. 1. The best thing about this software is its design and various range of available templates. All of these templates are professional in appearance along with great designs. It provides a wide range of invoices which are excellent. 2. The another major benefit of this software is that it saves your time while creating an invoice and filling in the data. 3. It also provides proper guidance and support to all of its subscribers in case the client which to migrate any existing database into its app. 1. The free version of this software provides you to send just one invoice, one estimate and only single statement per month which can be quite less for people who are running a serious business. 2. Another drawback of this software is that in case you have small or a medium business and you which to import any existing invoice database into this software, there is no availability of tools that can do this task. Overall, Billings Pro is quite an amazing software when it comes to excellent invoicing, estimate and account management, time tracking which makes it easier for freelancers and small to medium sized business. With this, we end our review of Billings Pro. Try this software to meet your requirement to create impressive and professional looking invoices. Don’t forget to mention your reviews regarding this software. You can also submit your views and suggestions in the comment section below.